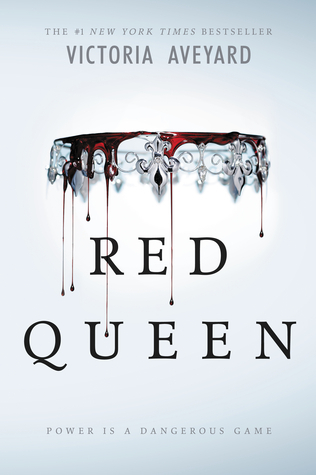 My most recent read was Red Queen by Victoria Aveyard and I thought it was fairly entertaining. The novel itself it a post-apocalyptic story similar to that of the Hunger Games. It reminded me of Katniss' tale in a few ways mostly because the protagonist Mare Barrow comes from one of the poorest neighborhoods in the region. The premise of the world Victoria introduces us to is a battle of silver blood and red blood. If you have silver blood you are royalty or of a prestigious family. Each person of silver blood has a special ability- magical powers and can use them to defeat others. If you have red blood you are a commoner. Mare is a thief; she has no job and steals what her family needs in order to get by. Her younger sister has a job working with silk and her three older brothers have all been sent off to war. Mare knows that she will be going off to war too, until she taken from her house and brought to the royal family to work. On her first day working for the royalty she accidentally reveals that she has powers of her own. The king and queen are fascinated that although she bleeds red blood she also holds powers so they decide to have her marry one of the princes and study her. They desperately do not want the public to know it's possible for a red blood to have powers like a silver. Mare quickly learns that she can't trust anyone as she realizes she anyone can betray anyone. Although I was entertained throughout this book and have downloaded the sequel, I wouldn't say it's my favorite book ever. I will certainly continue reading the series but it wasn't something I think everyone needs to read immediately. Have you read this? The next book is The Glass Sword and I'm finding it to be significantly slower then Red Queen. I have a few other book reviews coming up because I have been reading a little bit more frequently lately! What books have you read lately?